You may be familiar with our Garage Series Squat Rack w/ Pullup Bar and now we've added a Squat Cage to the roster. Now this Squat Cage is Garage Series for a reason. If you are a lifting over 700lbs, that's awesome but I would recommend our Commercial Power Cage over this one. 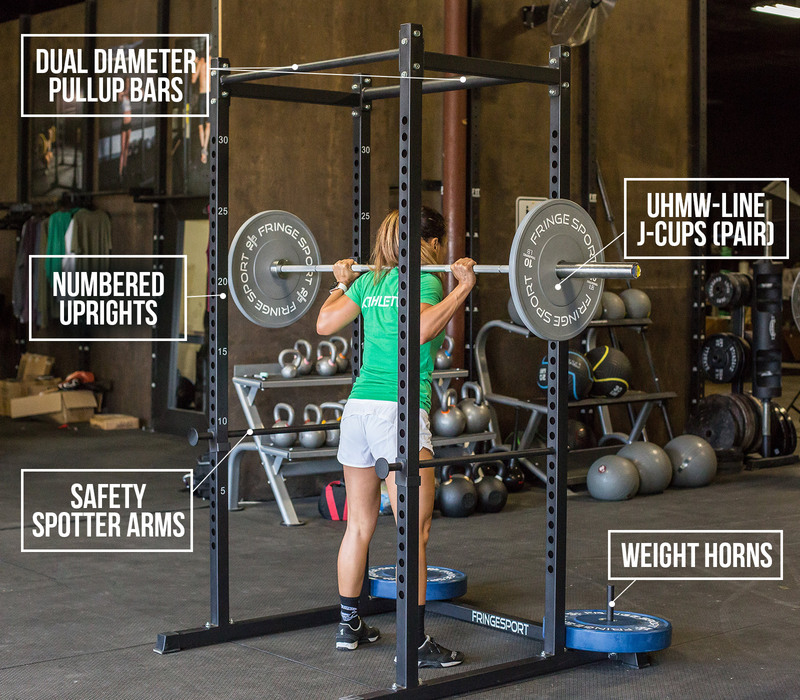 Here are a few of the Key Features you'll love when you buy this squat cage. Never Just a Rat in a Cage! ﻿You'll never feel like just rat in a cage with our Garage Series power rack. In fact, you might feel like you've walked into the Thunderdome instead and that your barbell has become an oversized war hammer. This freestanding power rack boasts our trademark durability, ruggedness and sturdiness. Once you step inside this power rack moonlighting as a construction elevator, you'll give yourself a lift, and go right to the top of your game. Comes equipped with 2 welded plate tabs if you would like to mount to the floor for added stability. Weight Horns on either side of the cage. Conveniently store your weights so they're ready to use. Bonus, the weight will add extra stability to this already sturdy rack. Adjustable Safety Spotter Arms give you peace of mind if you want to lift heavy during a solo sesh. The uprights are 2" x 2" with 1" holes and numbered so it's easier to align accessories. Two different diameter pullup bars - one standard 1.25" and one "fat" 2" diameter. The footprint on this cage is roughly 4ft by 4ft - great for smaller spaces. Our solid Garage Series power rack serves functional fitness users, lifters and builders equally well with a small footprint (48" wide x 53.5" deep). With its small footprint, this power rack will work well in compact spaces. Our solid Garage Series power rack serves functional fitness users, lifters and builders equally well. It's only $399 plus we offer FREE Shipping on top of that. Our commercial-grade squat cage comes in at $649 + Free Shipping, it has most of the same features this cage has but a heftier weight capacity. Contents: 1 - Squat Cage, 2 - J-Cups (1 Pair), and 2 - Safety Arms (1 Pair). Pullup bar diameter: Standard = 1 1/4", Fat/Axle = 2"